We’d love your help. Let us know what’s wrong with this preview of The World Weavers by Kelley Grant. But the war between gods and humans has e It has been a year since Sulis Hasifel fled to the desert, narrowly escaping death at the hands of a vengeful god. The time of the final battle, the final confrontation with the deities of her world, is nearing. Lured by the call of their long-trapped powers, the deities will descend upon the Obsidian Temple, where the Chosen await. To ask other readers questions about The World Weavers, please sign up. A satisfying conclusion to a very good fantasy trilogy. What especially attracted me to this series were the feli. Various great cats who were a type of self-assigned familiar. Much like the Chosen of Mercedes Lackey's Valdemar series. Only different. Because cats of any size are very distinctively for themselves. You can also see very subtle similarities between the racial divide of real life US and the races of this world Kelley created. At least it easily came to mind in the early part of the trilogy when the story set itself up. But to be clear, this is a fantasy world. Not an alternative or dystopian version of Earth. Series is an easy recommend. Start at the beginning and binge read your way through. Lucky you as I had to wait after the 2nd one. And unfortunately for me, I couldn't recall the full setting and exactly who all the players were and their factions at first. Took me a while to get that all back. That's partially my memory. Usually I get annoyed at too much re-capping being done in the first part of the book but given the varying motivations and backstories among the members of the main factions plus the gods and their own interpersonal relations, maybe there could have been a bit more recapping. HOWEVER, this is definitely specific to MY experience. And my fault for skipping my usual step of re-reading the previous book before reading the new book in any series. I read too much to properly retain much after even a couple months gap. For you, prospective reader, you will not have this problem. All three books are now out. If you've read the first two, you might want to skim over the 2nd book, esp near the end to refresh your memory. I look forward to more wonders from Kelley Grant! A satisfying conclusion to the trilogy. Kept me interested til the end. I really enjoyed the detailed character development. I will definitely keep an eye out for what else this author does. *This book was provided by the publisher for an honest review. 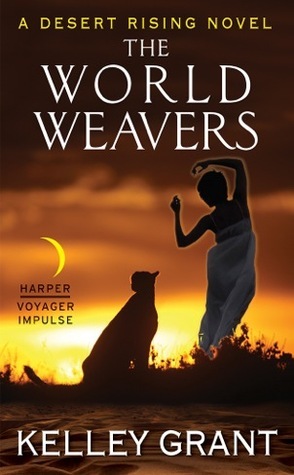 The World Weavers is the first book I have read from Kelley Grant, and I was pleased. I enjoyed the premise but will need to backtrack and read the first two books in this series to formulate an ecstatic over the moon opinion. Not that I would mind. Quite honestly Kelley's writing is enjoyable. While I told that I could read this book as a stand alone, I couldn't help but feel a little lost. Granted Kelley does give her readers backgr *This book was provided by the publisher for an honest review. While I told that I could read this book as a stand alone, I couldn't help but feel a little lost. Granted Kelley does give her readers background information by referring to the previous scenarios from books one and two so I was able to get into a rhythm and enjoy the book. In this book, Sulis Hasifel, the main character, fled her lands escaping her impending death by the hands of a vengeful God. World Weavers is jammed pack with excitement. Sulis' Twin brother joins the warrior tribe; the deities are herded to their doom, and there are CAT FAMILIARS called Feli. Need I say more?? My primary recommendation is for you to read the series in order!! It did take me a while to get my read on. Other than that it was EPIC!!! 4 Stars and a tip of my Nerd Girl hat!!! *This review was done in conjunction with Nerd Girl Official. It took awhile to get used to all the characters once again, as the world is filled with people and their feli. However, once my feet were back on solid ground, The World Weavers provided an exciting ending to the Desert Rising series. The history, religion and peoples throughout the book were rich and fun to explore. A few typos pulled me out of the story here and there, but overall, it was a solid ending to the series.